On Aug. 27, Hawthorne Community Association trustees hosted Hawthorne scholar Kazuya Ikuta, a professor of American literature at Kagoshima Women’s College in Kagoshima, Japan. Ikuta was visiting several sites in New England that were significant in Nathaniel Hawthorne’s life. Four trustees spent about an hour in conversation with Ikuta, discussing what this part of Maine might have like more than 200 years ago. They also took a trip to see the still-occupied Manning house nearby on Cape Road. Hawthorne’s maternal uncle, Richard Manning, built the Hawthorne House. They also visited the “hidden” graveyard behind the Manning house where the Mannings are buried along with first Raymond settler Joseph Dingley and other early settlers. 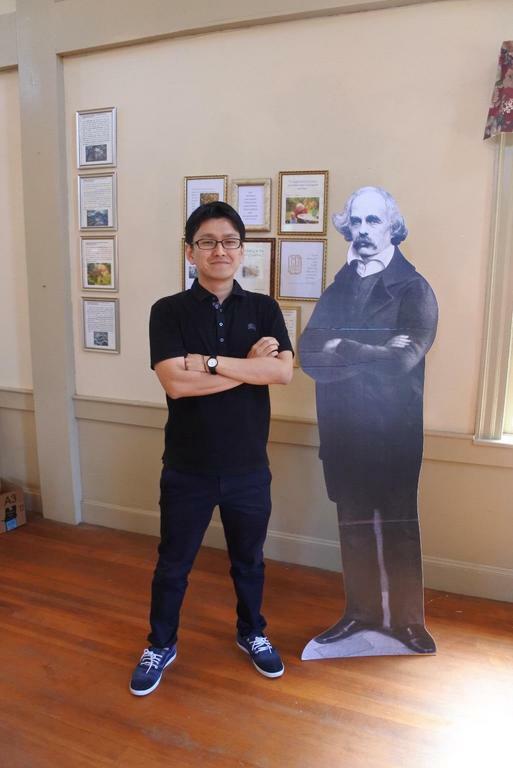 Following his Raymond visit, Mr. Ikuta planned to visit Hawthorne’s alma mater, Bowdoin College, as well as Hawthorne’s hometown of Salem, Massachusetts. Raymond will be having another community sing Monday, Sept. 24. from 6-8 p.m. at the Raymond Village Community Church, 27 Main St., hosted by the Raymond Arts Alliance. Pat Cannon, from Family Music Studio in Brunswick, will be the evening’s facilitator. All voices are welcome, there is no requirement of formal training or preparation for the event, which is designed to be an uplifting time of simple yet satisfying songs. Come learn chants and rounds from around the world. There’s a suggested donation of $2. treasurer of the Raymond Lions Club, the Lions have donated the funds to add two new and updated genealogy books to the circulating collection at Raymond Village Library. The Woman’s Club built and supported the Raymond Village Library, and McDermott also was deeply involved in the Raymond-Casco Historical Society and promoted historical research and preservation. The titles were selected to honor her dedication to historical research, preservation and the public library. Raymond Age Friendly Yard Sale will be take place from 8 a.m. to 4 p.m. Saturday, Sept. 8, at Sheri Gagnon Memorial Park, 63 Mill St. This is a fundraiser to support the mission and focus of the group in Raymond. For more information or questions, call 655-2222 or email agefriendlyraymond@gmail.com. Raymond Art Alliance is offering Qigong classes this fall at Raymond Village Community Church, 27 Main St. Karen Rendall of the Maine Center for Taijiquan & Qigong, will be the instructor. Classes will be held from 8-9 a.m. Saturdays beginning Sept. 15 and will continue through Oct. 20. There will also be classes on Friday evenings starting Sept. 21 through Oct. 5 from 5:30- 6:30 p.m. The fee is $5 per class, and drop-ins are always welcome. Hawthorne House trustees recently hosted Kazuya Ikuta, a Hawthorne scholar and a professor of American literature at Kagoshima Women’s College in Kagoshima, Japan.